There’s an area in Bournemouth – where I’d currently hang my hat if I wore won – known as the local red light district, and unfortunately it’s on the road upon which I live. Let’s get one thing cleared up right now: hookers do not look like Julia Roberts, and if they did, they probably wouldn’t be struggling for money, regardless of how much their flatmate spends on drugs. Remarkably, Aisha had neither seen nor heard much about this chickiest of chick flicks, filling the role of girly film of the decade between Dirty Dancing and the Notebook. And just like those two films, for anyone with a Y chromosome, this film is terrible. Firstly, Roberts’ streetwalker Vivian Ward is a horrendous role model. 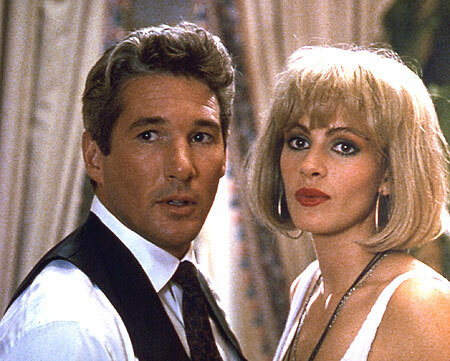 Not only is she a prostitute, by the end of the film it is clear she would have remained one forever were it not for Richard Gere’s ridiculously wealthy businessman Edward Lewis. The moral here kids is don’t worry, you’re live may turn to crap, but someday someone will come along, wave their magic credit card shaped wand and give you everything you’ve ever wanted. Essentially an, ahem, adult retelling of a fairy tale – Cinderella and Rapunzel are both namechecked – the film retains every sense of logic and reality of its inspirations. It’s only saving graces are from the supporting cast – Jason Alexander as essentially a more successful George Costanza and the great Larry Miller as a preening store manager (“She has my [credit] card” “And we’ll help her use it, sir.”), but otherwise the story is one-note and the lead performances average at best, with the actors feeling very robotic and over-directed. And even worse, Aisha has now added it to her Amazon wish list. This entry was posted in 04/10, 1001, Choose Life, Review, The List and tagged Garry Marshall, Hector Elizondo, Jason Alexander, Julia Roberts, Larry Miller, Laura San Giacomo, Pretty Woman, Richard Gere by jaycluitt. Bookmark the permalink.